Yesterday was that summery kind of Saturday with no plans. We decided, after hanging around all morning, to head into Boston. We had a few ideas: try to see the Tall Ships; stop off at Fenway Park to buy tickets using J's Kid Nation membership; see the new Rose Kennedy GreenWay. J thought it all sounded boring, but we dragged him out anyway. And it was a pretty good day. Here we are outside Fenway Park. We took the trolley into town, and walked through Fanueil Hall, watching some of the street performers and attempting to find a bathroom for me (no luck). Here you can see one of the living "statues": this is actually a person with very realistic statue-like makeup on! If you gave him money, he moved and handed you a slip of paper with a riddle on it. Very cute. Then we walked to the waterfront, tried again to find a bathroom (still no luck) and walked over to where we could see the Tall Ships. Then we finally found a bathroom for me (relief). After that, we walked along the Greenway for a while. It's kind of amazing to think that this area used to be the Central Artery (an elevated highway). Now it's an urban park. Hot and tired, we decided to head back to the trolley. I was starting to fade at this point. 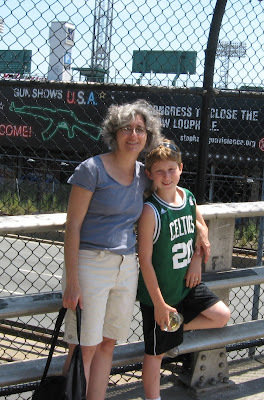 We decided that A and J would head to Fenway to see if they could get some tickets to the evening's game, and I would head home with the car. Turns out they were able to get tickets to the game, and it was a fantastic, exciting game. J got to see not one but two home runs by his favorite player Kevin Youkilis, and it was Big Poppy's 1000th hit as a Red Sox. I went to sleep, and A & J came home around midnight. Packed alot into a day. What was Sunday like? My screensaver is JoHo with his back to me in his "official" Youkilis shirt. What a lovely day, Adena. Great pictures. I saw my first 'living statue' in Manhattan and nearly jumped out of my skin when it moved!